Using pure water is essential to the health of a Venus Fly Trap. In general, tap water will not be good for Venus fly traps and can quickly lead to poor health and death. The minerals dissolved in tap water, commonly called dissolved solids, namely sodium, calcium, alkaline salts, sulfur, chlorine and magnesium, are detrimental to the health of your Venus Flytrap. Although it may not be immediately apparent with a few waterings, over time, the dissolved solids will begin to build up in the soil and can lead to a sickly looking plant and eventually death of the plant. Venus Fly Traps and all other carnivorous plants should only be watered with distilled water, rain water, reverse osmosis water (from an RO system). However regarding tap or well water, if one measures the water with a TDS (total dissolved solids) meter which indicates a TDS measurement of less than 50 ppm (parts per million), it is safe to use for Venus Flytraps and other carnivorous plants. Although higher levels of TDS can be tolerated (up to 100 ppm (parts per million)) or so, in that case the growing medium would need to be flushed occasionally by watering several times over a period of several hours or perhaps a day, and the plants may benefit from repotting (changing the growing medium) once per year or so. During their active growing season, Venus Flytraps should be monitored, especially during hot and dry weather, to ensure that their growing medium does not dry out completely. The growing medium ideally should be just moist, not soggy or waterlogged. 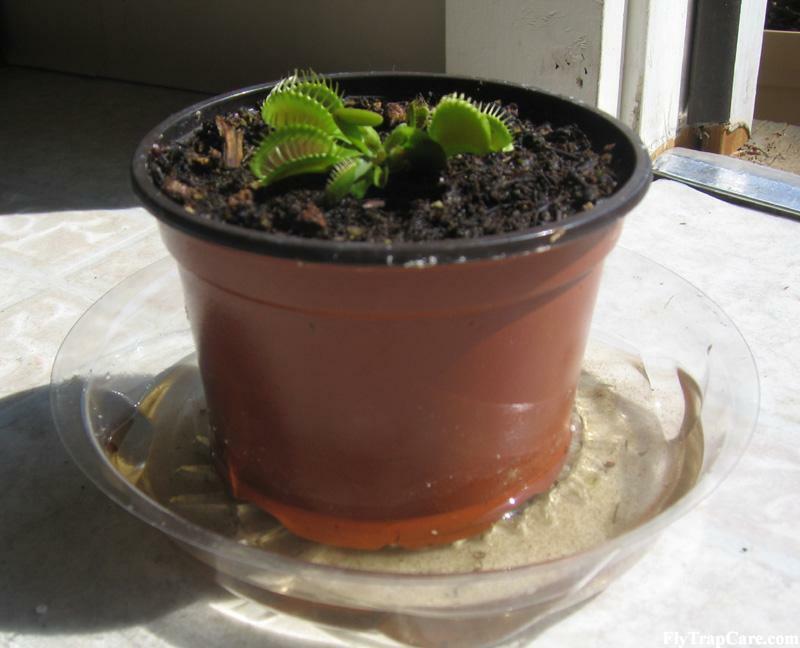 Therefore the tray method (described and pictured below) is best used only while Venus fly traps are in direct sunlight in hot weather, or when one goes on vacation to ensure that the medium does not dry completely. Otherwise, if the Venus flytrap and growing medium can be monitored, it is best to water and then allow the medium to dry until just moist before watering again. It is especially important during their dormancy to avoid wet conditions when it is very cool or cold at the same time. Because Venus fly trap should be kept cool for much of the time during their dormancy, it is best to allow the growing medium to become almost dry before watering again. Sometimes this means watering only 2-3 times per month during dormancy, depending on weather, humidity and the size of the pot the Venus fly trap is growing in (larger pots often retain water for a longer period). So keeping Venus flytrap soil “moist, not wet” most of the time is a good general rule, and it should be less moist most of the time during its dormancy when the air is cool to cold. One way to water a Venus Flytrap is the tray method. Above you will see a photo of the tray method which involves setting a pot with drainage holes in the bottom of it in a tray of distilled or other pure water. Most soil that Venus fly traps are potted in is very good at retaining water. The media will soak up water from a tray or bowl almost like a sponge. The tray method works well when plants are actively growing, are in lots of direct sunlight, and the weather is warm, or during vacations when one is not able to check one’s plants. However, the tray method is often not a good method to use all the time (see the paragraph above).